After our non-stop adventuring yesterday, I was ready for something simple and familiar. On our way out of camp we both commented that we were looking forward to an uneventful day of pedaling. 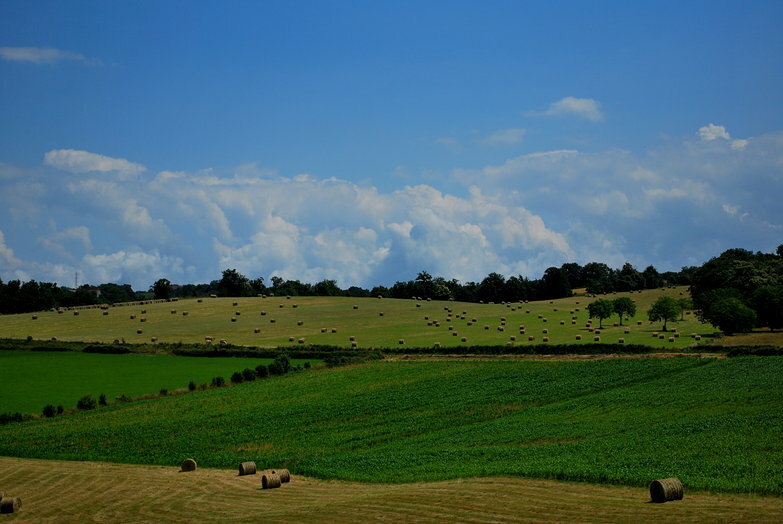 Our ride wound up being an endless series of hills under the blistering heat of the mid-summer sun. During days like this I often crack dryly about how I'm sure that this hill will be the last one. No, not the last one today, the last one for the entire trip! Yes ma'am, it is all downhill from here! Unsurprisingly and unfortunately for us, it wasn't. Ingrid and Yves' as planned, a day late. On the way in we passed a pack of cyclists in a supported group ride on their way to Perpignan. They yelled over to me asking if my bicycle had a motor and Tara laughingly informed them it was all muscle. I was hoping to ride with them for awhile but after one or two hills Tara dropped back and I waved goodbye, waiting for her. When she arrived I told her that I had a brilliant plan for when we arrived in Figeac, a plan that must be executed before we camped. I didn't even have time to tell her what it was, when she immediately exclaimed, "Oh, I know. I was thinking the SAME THING! We're getting ice cream!" We carried on, exhausted but cheery at the prospect of stopping early and enjoying a huge, cold tub of ice cream. 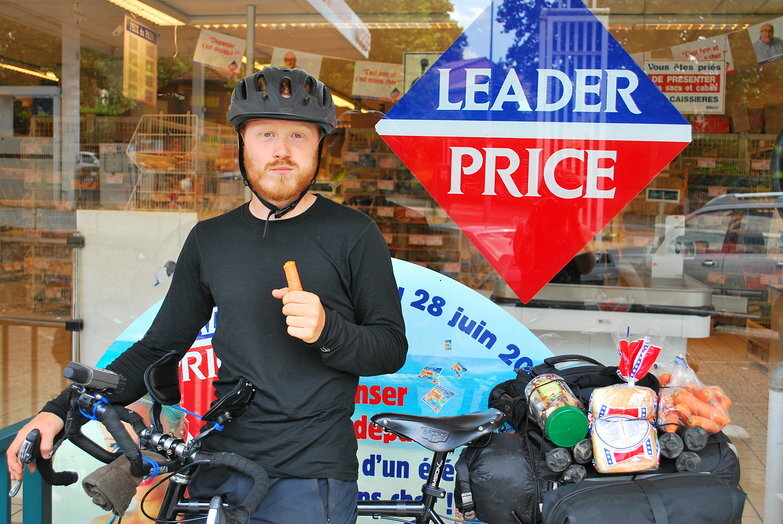 As we rolled into town we spotted a "Leader Price" discount grocer. Discount indeed! 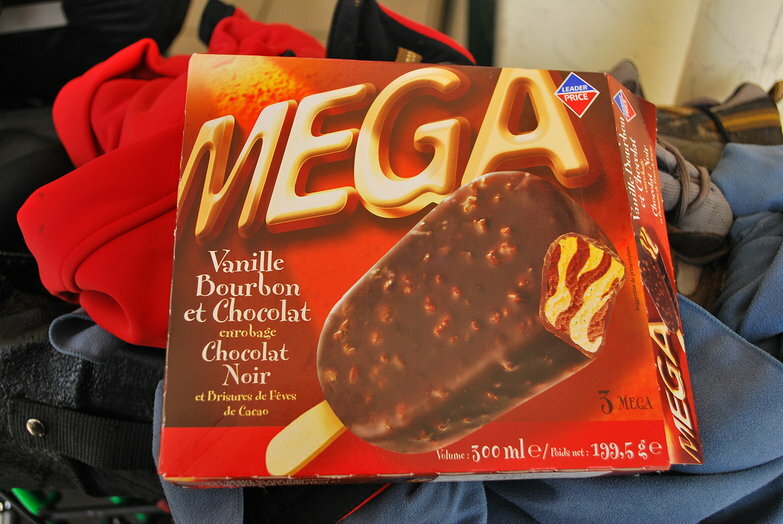 We found a package of three ice cream bars for 0.79 and promptly devoured them before returning to the store to restock our supplies. Feeling like kids in a candy shop, surrounded by cheap food and filled with a fierce hunger, we went… a little overboard. 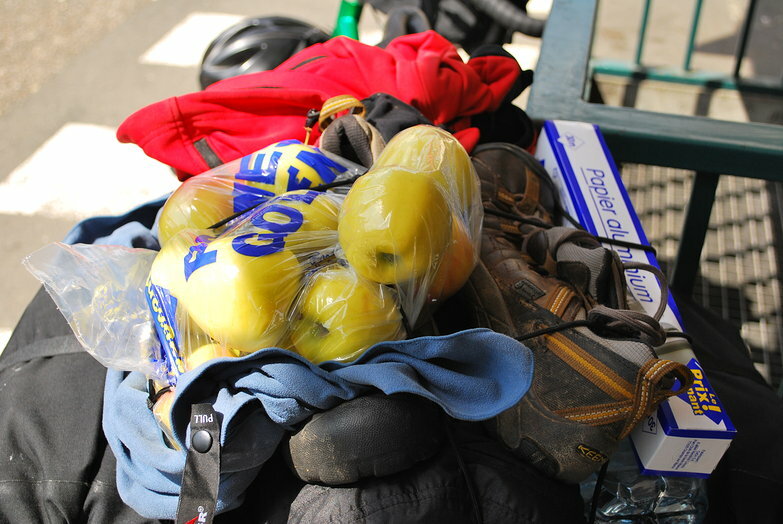 We filled every single nook and cranny of our bicycles with food and then strapped the rest of it to the outside of our bikes! I felt a little sheepish about my insistence that we purchase a 2lb bag of carrots when it came time to find space for it on my fully-loaded rear rack. I was tempted to propose that we eat them all before leaving, but instead managed to squeeze them under a couple of bungee cords. Laughing at ourselves, we teetered precariously out of the parking lot down to camp. Bursting at the seams, we rolled into camp and saw that our cyclist friends from earlier in the day had stopped to make camp in Fiegeac as well. As their support vans drove back and forth to and from the mass of identical blue tents at the far end of the campsite, we smiled, waved and yelled jokes at one another. 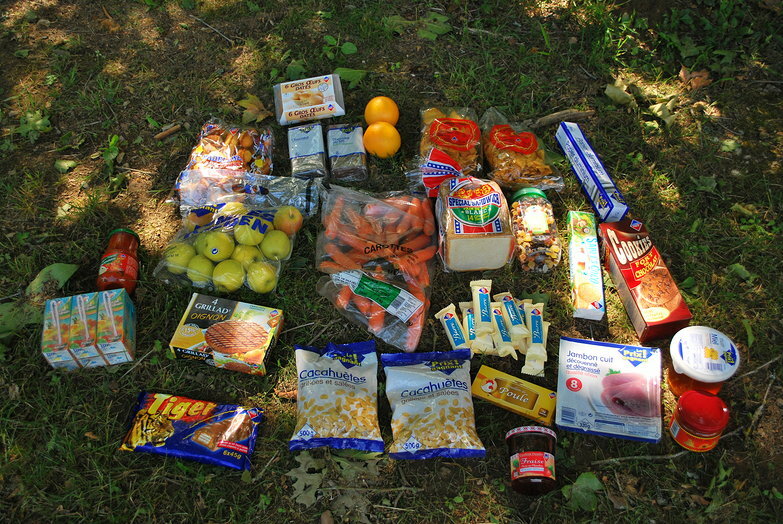 While I made camp, Tara spent hours dealing with our bourgening food situation. I was done setting up camp, had taken a nice long shower, and was far into a work project when she had finished re-consolidating tupperwares, preparing carrot-sticks, divvying up snacks, and making lunch for tomorrow. 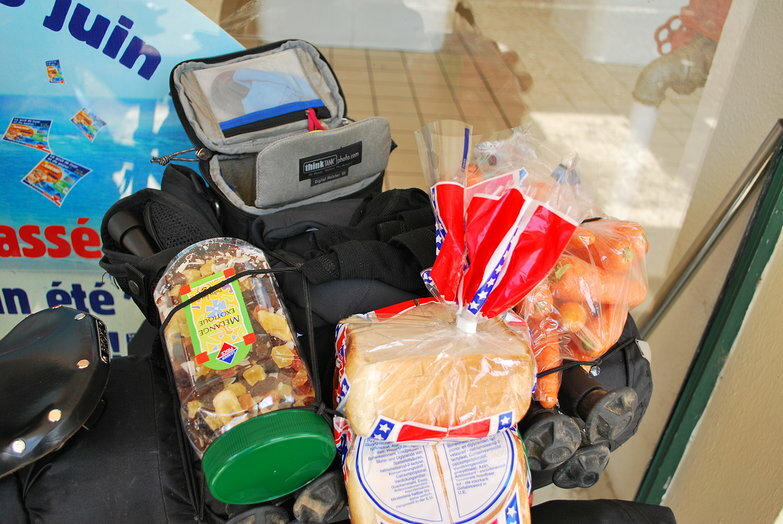 Somehow Tara managed to make all of our new food fit into our panniers! She was obviously ready to be done with food, so I sent her off to take a shower while I made dinner. She had laid everything out, so all I had to do was cook. When she returned, we feasted on burgers, chips, and salsa, and settled in for an early night. Now that we have lots of food, and ample time to sleep, we should be well prepared for what will undoubtedly be another hilly ride tomorrow!